The CFO of Menu Foods, Mark Wiens, sold about half of his shares in the company three weeks before the poisoned pet food recall was announced, Canadian insider trading reports show. Here’s another horrible coincidence: Menu Foods also waited three weeks after discovering the kitty and doggy deaths before announcing the recall. The chart comes from ReligiousTolerance.org but a better synopsis, and the excerpt below, comes from CreationTheory.org. Divorce rate: Is marriage strengthened by mutual faith in God? Are marriages weak without religion? The Barna Research Group conducted a poll of Americans in 1999 in an attempt to show that religious faith reduces the likelihood of divorce. The results shocked them: Atheists had the lowest average divorce rates (defined as the percentage of people who had been divorced at least once in their lives), at 21%. Christian divorce rates averaged about 24% (higher for “born-again” Christians, ie- fundamentalists, at 27%), and even higher for Jews, at 30%. They also collected racial and geographical data, which showed that the white Southern Baptist fundamentalists have no reason to crow about their “family values”. Not only did the Southern Bible Belt have the highest divorce rate in the country, but whites as a race are the most likely to split: 27%, as compared to 22% for blacks, 20% for Hispanics, and only 8% for Asians like me (and you thought I was just blowing hot air about that “till death do us part” stuff). UPDATE: interestingly enough, Barna Research later edited that article to lump all “non-born-again adults” into a single category, thus “accidentally” obscuring the embarrassing fact that atheists had the lowest divorce rates. But that doesn’t mean I’d be willing to accept the pretensions of a “medium,” who claims to channel the spirits of the dear departed, when I’m aware the practice is rife with fraud. I know how much I want to believe that my parents have just abandoned the husks of their bodies, like insects or snakes molting, and gone somewhere else. I understand that those very feelings might make me easy prey even for an unclever con, or for normal people unfamiliar with their unconscious minds, or for those suffering from a dissociative psychiatric disorder. Reluctantly, I rouse some reserves of skepticism. How is it, I ask myself, that channelers never give us verifiable information otherwise unavailable? Why does Alexander the Great never tell us about the exact location of his tomb, Fermat about his Last Theorem, John Wilkes Booth about the Lincoln assassination conspiracy, Hermann Goring about the Reichstag fire? Why don’t Sophocles, Democritus, and Aristarchus dictate their lost books? Don’t they wish future generations to have access to their masterpieces? If some good evidence for life after death were announced, I’d be eager to examine it; but it would have to be real scientific data, not mere anecdote. As with the face on Mars and alien abductions, better the hard truth, I say, than the comforting fantasy. And in the final tolling it often turns out that the facts are more comforting than the fantasy. 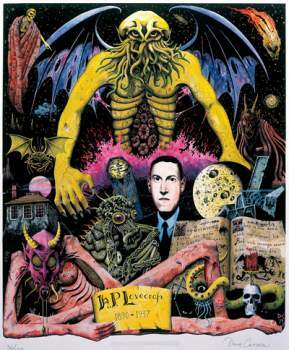 Given the power of his vision, many have speculated on just how much Lovecraft knew about the occult. Some occultists hail him as the prophet of a new Dark Age, claiming that his fiction bears genuine traces of ancient knowledge and re-emerging archetypes from the depths of our collective unconscious. Yet, all too often, their conclusions are based on guesswork, rather than the evidence of his own writing. Fortunately for us, he had perhaps one of the best-documented lives in literary history, writing approximately 100,000 letters over his 46 years. Through these letters, and other newly discovered sources, a glimpse into the reality of Lovecraftâ€™s occult lore is finally possible. I chose to implement in Lego a slightly different version of the original Turing machine. Instead of having a bi directional tape, it uses a stack. When the symbol beneath the stack is read (and removed), the machine changes “states” and can add zero, one or two symbols on top of the stack. This variation is maybe very different yet it is possible to show that this simple machine has the same capabilities than a Turing machine. Among other things, it can emulate a Turing machine placed on the stack.